Stanford's Center for Computer Research in Music and Acoustics (CCRMA) will hold its annual free open house on Friday, March 1, 2019, from 10am to 5pm. CCRMA students, faculty, and staff will present their research in a wide variety of formats. Throughout the day, there will be musical performances, lectures, hands-on demonstrations, and posters showcasing recent CCRMA research in fields including but not limited to: music in the virtual reality; internet reverb; neuroscience of music and of narrative engagement; digital signal processing; programming languages for music and sound synthesis; data-driven research in music cognition; and a musical instrument petting zoo. CCRMA is located at The Knoll, 660 Lomita Court, Stanford CA 94305 (https://ccrma.stanford.edu/about/directions). Check https://ccrma.stanford.edu/events/ccrma-open-house for continuously updated details and a schedule of events. 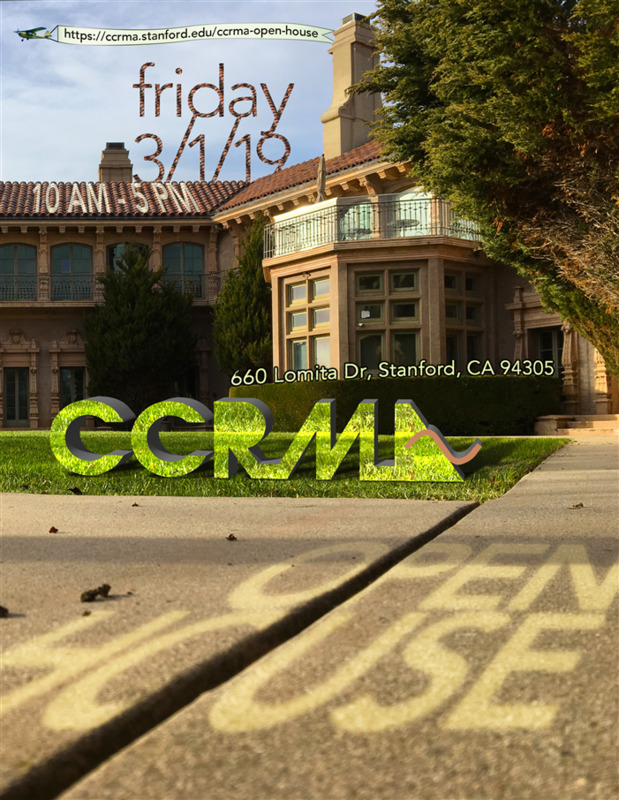 For more information contact Matthew Wright at openhouse2019@ccrma.stanford.edu or 650-723-4971 x304.